Still searching for just the right tech gifts for Christmas? Here are a few bright, colourful ideas that might make the last-minute rush a little easier. While a light bulb may not seem like a suitable stocking stuffer, the TP-Link Smart Wi-Fi colour LED bulb is not only useful and practical, it’s also fun. It plugs directly into any standard light socket, and you can control remotely through your iOS or Android device from anywhere with the free Kasa mobile app. The app lets you manage your lights, from adjusting the brightness to selecting one of thousands of colours. Whether you’re in a sombre mood or ready to party hardy, there’s a colour for that. Even if you simply want white light, you can adjust the bulb from soft or cool to bright or daylight. The app allows you to schedule when you want your lights to turn on and off. And it can track energy usage, which will be really low as this bulb can reduce energy consumption up to 80 per cent compared to a 60-watt incandescent bulb. The app can also be used to control other TP-Link Smart Home devices. 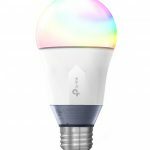 The TP-Link Smart Wi-Fi Colour LED Bulb is compatible with Amazon Alexa. And no hub is needed since the system connects directly to your Wi-Fi. It retails for about $60 and is available from Amazon or Best Buy.ca. Another great little stocking stuffer is the Elf Smart Plug by Eques. 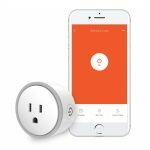 It plugs directly into any standard AC socket and allows you to control the power to any electrical device you plug into it, with the help of a handy app. You can easily schedule devices to switch on and off, whether it’s the lights on your Christmas tree or a lamp in your living room to deter unwanted intruders. It can also handle up to 1,800 watts, so you can safely control power-hungry devices like fans and coffee makers. And when your phone is fully charged, Elf’s smart charging protection feature automatically switches itself off. This not only conserves power, it avoids the possibility of overcharging and damaging your battery. Elf Smart Plug is one of those gadgets you don’t realize you need until you try it. Once you do, you’ll wonder how you did without it. It easily connects to any home Wi-Fi router. Elf Smart Plug also works with Amazon Echo and Google Home, so you can control it via voice control. It sells for $31.99 and is available from Amazon. 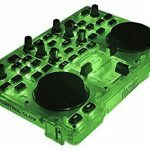 A super little gift for casual DJs and DJ hopefuls, the Hercules DJControl Glow is a USB-powered DJ controller that offers two decks to mix two tracks, with a plethora of mixer controls. It has a compact translucent body that delivers a funky green LED light with glowing effects when powered. But it’s the music that really gets the party started. You can control the mix with two jog wheels to shuttle the music; two rotary encoders and six rotary potentiometers to adjust the sounds; and three faders (two volume faders and one cross-fader) to blend it. It also has 36 push-button transport keys and 24 backlights for endless fun and possibilities. It comes with Hercules’ DJUCED 18o app that helps you have more fun and spend less time concerned about the technology. For beginners, there are simple automations that help you auto cue and instantly synchronize songs. The app also allows you to equalize your music, add your touch with special effects like echo and reverb, and then save your creation. Hercules DJControl Glow supports many audio file formats like mp3, wav, wma, aif, etc., and is designed for PC (uses Windows Media Player) or Macintosh (uses iTunes library). It retails for $99 (on sale now for $79 or less) and is available from places like Long & McQuade, TheSource.ca and Amazon. This last light-inspired gift idea won’t so much brighten up a room as lighten up the eyes of action and adventure role-playing gamers of all ages. 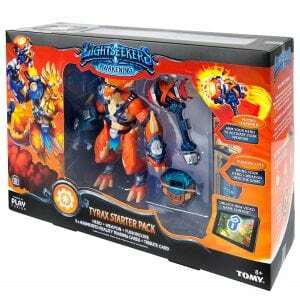 More than just a game or a toy, Lightseekers Awakening – Tyrax Starter Pack by PlayFusion, manufactured by Tomy, leverages the latest iOS and Android smartphones, tablets and apps, incorporating some of the latest technologies to take fun and challenge to a new level. No gaming console is required. It brings together role playing, smart action figures and collectible trading cards that can come to life through augmented reality. All of these can be collected or played with on their own. But all together, they seamlessly create a cool immersive live action and video game experience. Lightseekers takes place in Tantos, a fantasy world full of magic and mystery. After centuries of peace, the evil Umbron returns, threatening to wreak havoc. Jax the Tyrax is a Lightseeker comes in a seven-inch digital action figure. Jax can interact between the action figure and the onscreen game, powered by a rechargeable power pack and connected to the game via Bluetooth. The Jax figure talks, vibrates and displays different colours that tell you his status, levels and even warn you of impending danger. Jax uses weapons like the Nitro Hammer that gain power through the game. All these in-game attributes and more can be stored in perpetuity as your character and the game evolve. Jax is just one of many Lightseekers (each sold separately) with unique personalities, attributes and abilities. There are also other accessories – weapons, flight packs – and more trading cards you can bring into the game for endless fun. The Lightseekers Awakening – Tyrax Starter Pack retails for $99 and is available from ToysRUs and Amazon (currently $69). If you want to get the complete story and premise of the game, or get started without any action figures, you can find out more or download the app for your device at Lightseekers. This article first published at Troy Media.